16 plane crash victims remained alive for 72 days until being rescued by eating their dead friends’ bodies, a victim told the news media. Forty years since the accident that changed his life forever, Dr. Roberto Canessa still vividly remembers having to eat the flesh of friends to survive. He was one of 16 men who escaped death when their chartered plane crashed in the desolate Andes mountains between Chile and Argentina on October 13, 1972. It took 72 days until they were rescued after Dr. Canessa, then a 19-year-old medical student and another survivor wandered for 10 days to get help. Today, the Dr. dedicates his life to others, but has never forgotten the moment he became cannibal and ate the flesh of one of the dead passengers. He told the news media: "It was disgusting. Through the eyes of our civilized society that was a disgusting decision. My dignity was on the floor having to grab a piece of my dead friend in order to survive. But then I thought about my mother and wanted to do my best to see her again. I swallowed a piece and it was a big step, but nothing happened." Dr. Canessa, now a top pediatric cardiologist, was one of 45 passengers, including his Christian Old rugby team, flying aboard the Uruguayan Air Force 571 when it hit a mountain wrapped in fog while flying from Santiago to Montevideo. Twelve men died on impact, five more in a matter of hours and then one more a week later. Tragedy struck again after 17 days when an avalanche killed eight more passengers. 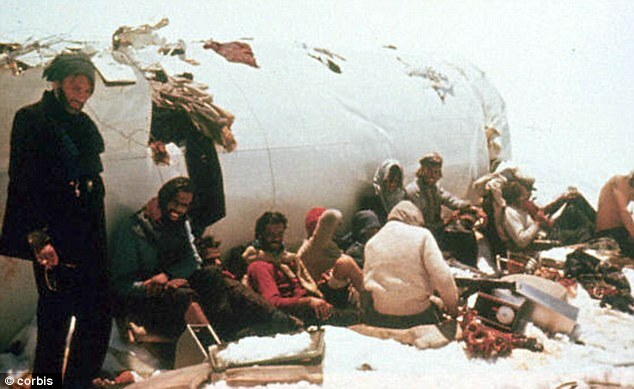 The survivors had little food and no source of heat in the harsh conditions at over 3,600 meters or about 11,800 feet altitude. Faced with starvation and radio news that the search for them had been abandoned, the remaining passengers started eating the dead passengers whose bodies remained preserved in the snow. Rescuers did not learn of the survivors until 72 days after the accident, when Nando Parrado and Dr. Canessa, began to seek help and stumbled upon Chilean Sergio Catalan, who gave them food and then alerted authorities. Their harrowing story was told in the 1993 film Alive, but the real-life trauma of his last weeks in ice still haunts Dr. Canessa. He recalls that the cold in his bones was like scissors cutting into them. He said: "We were in a lifeless environment with only snow and stars. We were in a place not meant for humans to survive."